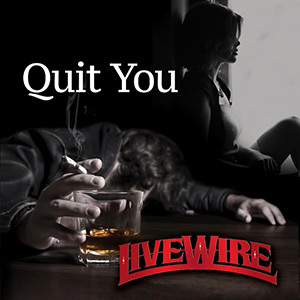 LiveWire Releases New Single "Quit You"
NASHVILLE, TN (January 26, 2015) - Independent Country band, LiveWire, releases their latest single, "Quit You," today on Way Out West Records. The song is available to radio programmers via CDX Volume 611, digitally via CDX "InstaTracks," CD Tex, and Play MPE (1/27). Fans can purchase the single at iTunes at this link. Release plans for "Quit You" include an Exclusive Premiere at "Rawhide and Velvet," online blog of uber-popular social media maven, Rita Ballou. LiveWire will also host a listening event and live chat with fans on their Facebook page at www.Facebook.com/livewirecountry from 8-9 PM CT today. The band has scheduled multiple single release concerts at various venues in their home state of MO. "Quit You" is the follow-up to LiveWire's 2014 hit single, "Drivin' You Outta My Mind," which charted Top 30 on the MusicRow chart, Top 10 on the Texas Regional Radio Report, and Top 15 on the Texas Music Chart. It also claimed "Top Songs of 2014" slots on multiple Texas/Red Dirt and mainstream Country music charts. Both songs will be included on the band's forthcoming EP. "Quit You," co-produced by Paul Carabello and Clif Doyal, is a powerful, edgy and passionate ballad that focuses on addictions and their devastating effects on a relationship. Written by LiveWire lead singer, Andy Eutsler, along with Danny Bell and Nashville writer, Jeffrey Joseph East, "Quit You" showcases Eustler's range as he delivers an emotional vocal performance, backed by the impressive instrumental talents of the band's lead guitarist, Bobby DeGonia; fiddle player, Cory Shultz; drummer, Brad Allen; steel guitarist, Scott Kwapiszeski, and bassist/guitarist, Carabello. Recent performances across TX, OK, MO and KS have brought legions of new fans to the band, and their 2015 tour schedule is filling up with prime dates, including their first International performance at the Festival Country Rendez-Vous, in Craponne sur Arzon, France, where they will join a long list of prior headliners including Eric Church, Guy Clark, Mark Chesnutt, Tanya Tucker and Rhonda Vincent. Early reviews for "Quit You" are very strong, and the enthusiastic response from fans and critics alike are certain to propel the 2014 Texas Regional Radio Music Awards nominees for "New Duo/Band/Group of the Year" to new heights.